The start of March means its time to review our February book club book for you! Ashley over at If You Give a Girl a Ring selected "Beautiful Ruins" by Jess Walter for us to read this past month. 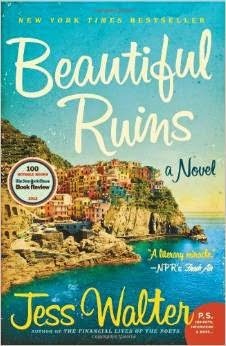 She recently traveled to Italy with her husband and was excited for us to read a book set partially in Italy. The story begins in Italy in 1962 when a dying actress visits a small hotel off the coast. The following chapters tell the tale of the innkeeper and the actress and how their lives weave together. The book jumps between Italy and the present day in Hollywood as the Italian innkeeper goes in search of the actress he let get away. This book had a bit of a slow start for me. I was finding it hard to keep track of some of the characters, especially as it jumped back and forth in time. However, as I got into it, I enjoyed seeing how Jess Walter wove together the different lives of all the characters. The characters became more connected as the story went on and it was interesting to see how the choices of each character affected the others. It didn't have any twists (as I think of them in thrillers) but I was surprised by some of the relationships developed between characters and how they came together in the end. Head on over to the other blogs and see what they thought of the book too! For the month of March, I chose the book for us to read. We will be reading "One Moment, One Morning" by Sarah Raynor. This has been in my "To Read" list in Goodreads for quite some time. If you are a blogger and interested in joining our book club, email me for more information! If you love to read but don't have a blog, you can still join us! Each month, on of the members of the Beauty Blogger Book Club (BBBC) will choose a book for the club to read. At the beginning of the following month we will share a book report/summary for our readers to enjoy and share the book for the following month.